Breathtaking mountain adventures await you in the magnificent and awe inspiring Eastern Sierra. The Bishop area offers snowshoeing, cross country skiing and backcountry skiing (Nordic and alpine touring). This area is home to many fourteen thousand foot peaks with spectacular skiing opportunities. Where to go, just follow the snow to the White mountains, Bishop Creek Recreational Area, Rock Creek Canyon or follow the crest to Mt. Tom. Take West Line Street up towards Aspendell and you’ll find great places to sled, snowshoe, and cross-country ski. When there is plentiful snowfall, Bishop Creek Canyon is a scenic winter spot to bring your toboggans, tubes, or sleds. If high adventure is what you are looking for, just go follow Pine Creek Road 12 miles north of Bishop and this will lead you into the high country. Or you can take one of the many trails that leads you to the snowy peaks and deep power only the sierra’s can offer. Some resources for winter adventure include guide services and retail outfitters. The White Mountains offer extraordinary scenic vistas, quiet isolation and fantastic adventure. You can reach the Mountains by heading south of Bishop on Highway 395 for 14 miles to Highway 168, just on the north end of Big Pine where you will go east on Highway 168 for approximately 20 miles and take the road to the Ancient Bristlecone Pine Forest. There you will find great opportunities for snowshoeing until your heart is content. Great scenic overlooks and campgrounds will make your stay a long and enjoyable adventure. Remember to dress for cold weather and please be careful as you enjoy the great White Mountains. 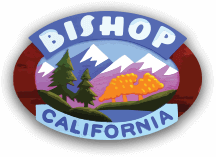 Bishop Creek Recreational area offers tremendous access to trails and winter fun just a few miles west of Bishop. Here you will find miles and miles of trails, fun and winter adventure. Just take Highway 168 (West Line Street in Bishop) for 16 miles to the magnificent high country of the Eastern Sierras. You will find trails in and around Lake Sabrina and along the South Fork of Bishop Creek. Enjoy! Rock Creek Canyon offers beautiful awe inspiring winter beauty and adventure. To get there, take Highway 395 north from Bishop to the Tom’s Place Exit. Go south or left, on Rock Creek Road to the winter road closure, park and get ready for your day in the snowy winter wonderland only Rock Creek can offer. Bring your Cross country skis, snowshoes and be sure not to forget your camera to capture the adventures of the day!